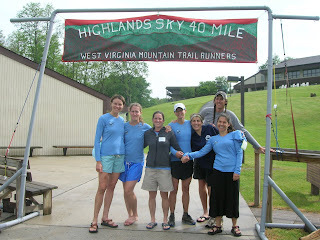 All local runners participating in the Highland Sky yesterday completed the forty (40) mile race! As always, our locals have evidenced the amazing athletic ability the mountain top is known for. Congratulations and well done to everyone, Willie (two ((2)) hours faster! 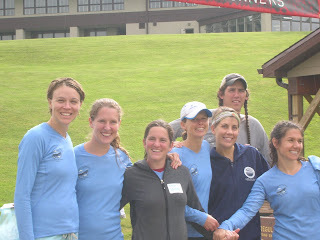 ), Sarah, Kim, Anne, Abus, John, Ryan, Brian, and hopefully I didn't miss anyone. If you ran and I failed to mention you, please correct me. The race results have yet to be posted, but I will link them when they are available. Today's photos are courtesy of Abus' camera, thanks Abus. Abus, amazingly mobile, made her way into the shop to cook today. Another batch of Smoked Salmon Cream Cheese (according to Nick this batch is the best yet!) and a hybrid Lemon and Lime Bar. Good work Abus! Mackie, Jason, and Mike (of Sirianni's fame) are on their way to Calhoun County for the Appalachian Classic Bike Race. As always, I expect tales of hard fought battles now won. If memory serves, this one is for $$! There has been a lot of talk regarding this pot eradication. After speaking with several "eradication officials" in the area I have learned that, although not as prolific as rhododendron "mary jane" grows in the mountains, and when found, the preferred method of disposal is burning. The burning method was endorsed by all of the eradication officials. As one official put it, "if you see pot, burn it immediately and continue burning until it is gone." Will do!